Home / Blog	/ Why Do Cheetah Have Tear Marks? Why Do Cheetah Have Tear Marks? Ever wondered why Cheetah have ‘tear marks’ on their faces? According to an African legend, these distinctive markings originate from one female Cheetah. Mother of two, she had to hunt constantly to feed herself and her cubs. Her proficient hunting was observed and admired by a lazy human hunter who devised a plan and stole her defenseless cubs. When their mother found them missing, she cried for months on end and her tears formed two permanent Cheetah tear marks. She eventually had new cubs which bared the same markings and is why today all Cheetah have tear marks, according to this legend. In truth, these markings play an important role for Cheetah by reflecting the glare of the sun while hunting. These markings are especially helpful in open plains where the glare of the sun is extremely bright. In addition, by minimizing glare, Cheetah can remain focused on moving prey during what is usually a very high-speed chase. Cheetah tear marks on a male. 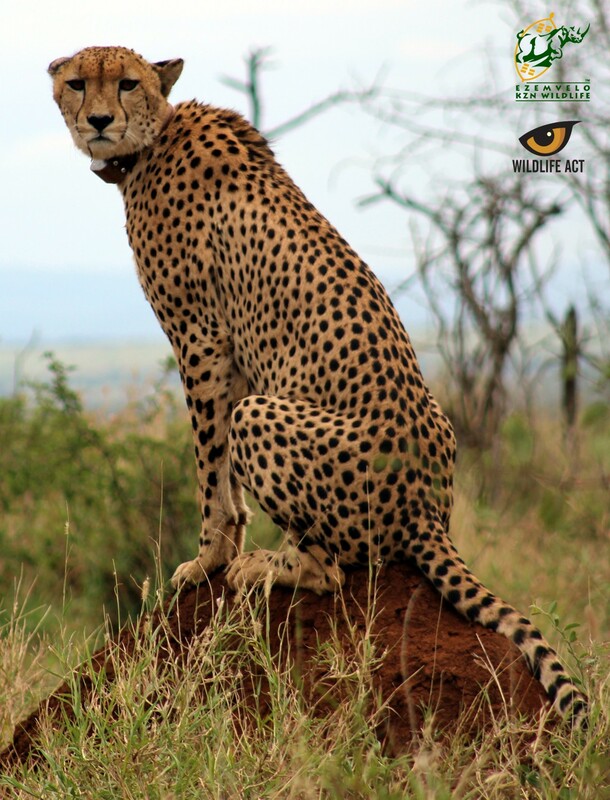 The Cheetah pictured above is one of the resident males in the uMkhuze Section of iSimangaliso Wetland Park. His tracking collar allows for accurately pin-pointing his location and chance of a sighting, and on the rare occasion, witnessing a high-speed chase or find him already feeding on a kill. His Cheetah tear marks certainly play their part in his hunting success rate. The Wildlife ACT uMkhuze monitoring team collects valuable data on his movement patterns, behaviour and general condition and is part of a bigger team within the reserve. Within this team they assist with a supporting role under the supervision and guidance of Ezemvelo KZN Wildlife. This partnership helps to conserve priority species such as Cheetah to enhance their chances of survival in the foreseeable future. The information that is gathered through the monitoring sessions helps Ezemvelo to make informed decisions to effectively manage animals in game reserves such as uMkhuze.